I love Halloween. Dressing up completely fuels my imagination and so I was thrilled and ecstatic when one of my best friends decided to have a Hallowe’en party – costume mandatory. I began discussions with Mr. Niceguy about coordinating our costumes. Apparently, coordinating costumes is a foreign concept to Mr. Niceguy for while I was thinking Wills and Kate or Harry Potter and Hermione he was thinking, military guy circa before a time we were born. What would I go as? This was not a game of good guys versus bad guys. It wouldn’t make much sense for him to go as a sniper and me to go as a vampire, now would it? Alas, Mr. Niceguy came down with a terrible cold and I was left to go solo. With a wandering mind, perpetual ADD, and commitment issues, I decided! 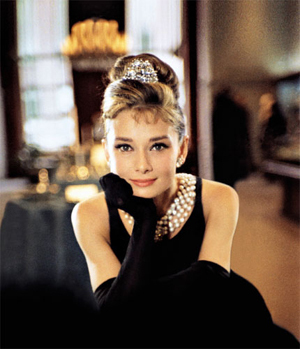 I clipped on some fake bangs, put my hair in a bun, threw on a black dress, and transformed into Holly Golightly (aka, the timeless Audrey Hepburn in Breakfast at Tiffany’s)! 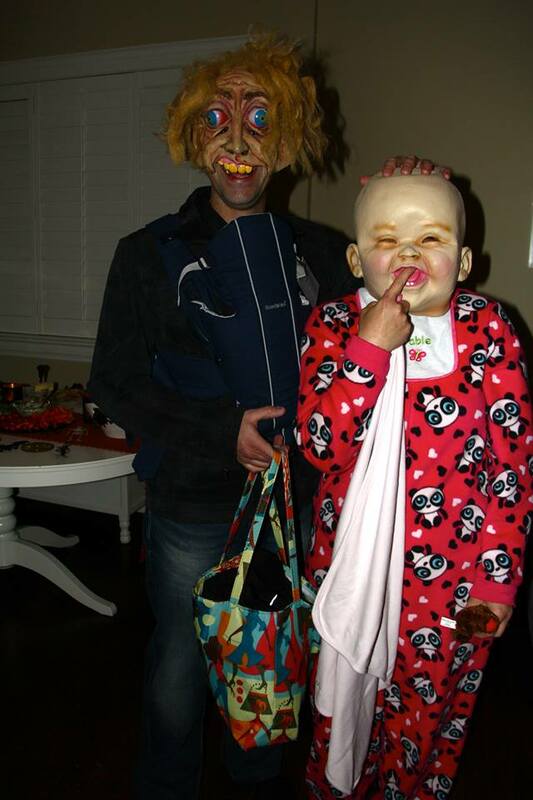 The best part of Hallowe’en is entertaining people…and even freaking some people out! And though I had initially intended to do the freaking out part, I settled for being entertaining instead. Despite the lack of a pair of long black gloves and the iconic cigarette holder, I daresay, this costume was a success! In walked the most grotesque “thing” accompanied by a giant, grimacing baby. The “thing” had a deformed face with weird eyes and was very obviously a mask. 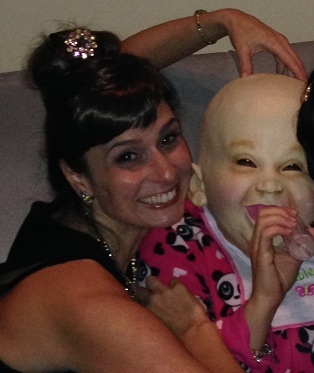 But the giant grimacing baby…it was so unnatural. So strange. It’s gigantic head was in proportion to the rest of its body had the baby actually been 5 feet tall. It was an abomination! It was a masterpiece! My deepest, basic instincts took over. I wanted nothing more than to scream, to push it away and to destroy it! I was at once terrorized and mesmerized by the way it danced and pranced around the room. Witnessing this costume had made repulsion and admiration, one. Had my basic instincts taken over so much that I’d gone absolutely mad? I recalled a Hallowe’en long before Mr. Niceguy… I had been cajoled into walking through a haunted house full of booby traps and monsters that would pop out of the shadows and try to grab you. I remember our group walking through the maze – all holding hands, moving together in the dark. Suddenly, a thing came out of the shadows and tried to grab a hold of me! There’s a saying: when you’re being chased, you only need to be faster than the slowest person (thanks Diary of a Wimpy Kid). So I broke the chain and ran screaming out, leaving the fourth behind as sacrifice. That fourth was my then boyfriend. Though at the time I had regretted that I was willing to leave him behind for my own safety, and I had questioned and analyzed what my behavior truly said about the kind of person I was, today, I take a lighter approach. Costumes, dress up and Hallowe’en are a time for abandonment. The best part about Hallowe’en is taking advantage of the reprieve from the norm. Of not feeling like you have to be responsible. Of pretend, fear and hysterical laughter. Of imaginations running wild. Lose yourselves for one day. Happy Hallowe’en. « I’m a convicted felon! Disturbing beyond belief! I wanted to drop kick that baby!! Thank you for reading and your comment! You make a beautiful Holly! Happy Halloween!